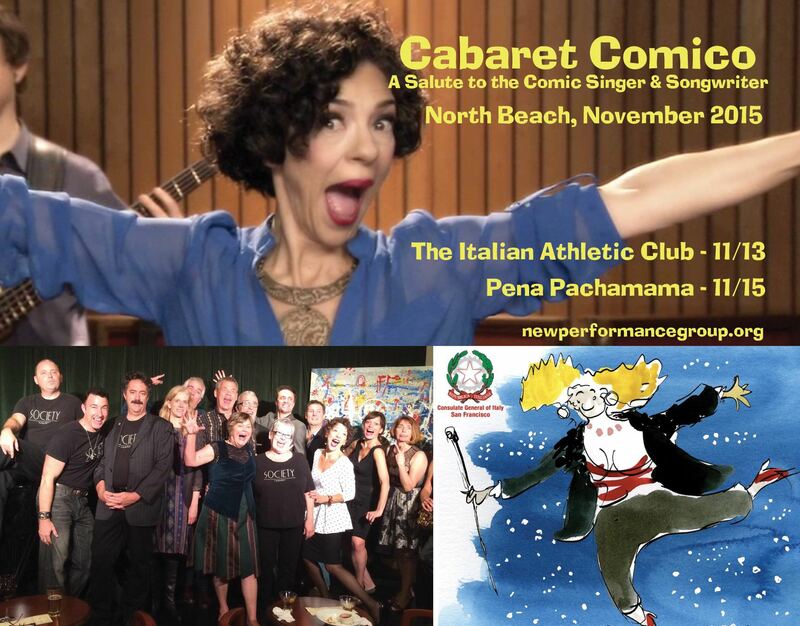 The intimate and historic North Beach music club Peña Pachamama welcomes the second Cabaret Comico event, The Songwriter’s Showcase. This is the perfect opportunity to meet and speak with (even sing for) our visitors from the Italian Club Tenco and Shaman to Showman music festivals, both dedicated to the development of original song and the singer-songwriter. Sunday, November 15, 2015 at 4:00pm, Songwriter’s Showcase & Organic Dinner. Produced in collaboration with Lauralee Brown, co-manager of the San Rafael Chapter of the West Coast Songwriters Organization. One of my most treasured cultural exchange experiences was a dinner among artists in 2003, the year my girl trio The Kitchenettes sang in the first edition of From Shaman to Showman, at that time a new Italian cabaret festival dedicated to original comic song and comic performances. Hoping to re-create such an environment in which people can exchange music and share food, I approached my like-minded friends, the band Sukay, who are the owners and operators of the historic North Beach world music club, Peña Pachamama. I’m delighted to say that in collaboration with Quentin and Eddy Navia and with Lauralee Brown of the West Coast Songwriters Organization, San Rafael Chapter, Cabaret Comico presents the Songwriters Showcase and Organic Dinner. Our November 15th event, the Songwriter’s Showcase and Organic Dinner will feature talent from the San Francisco Bay Area and beyond. It will be a wonderful chance to meet more folks in the greater songwriting community, perhaps swap songs and network to open up more musical opportunities. There will be a prix fixe menu for all participants – performers and audience alike – of Organic, Bolivian GF fare; Prix Fixe Dinner: $29.95 includes a variety of delicious organic and gluten free appetizers and dinner specialties, (http://pachamamacenter.org/?key=food) with a refreshing organic limeade. (wine, sangria and other drinks are moderately priced, available at the bar). The 2-course meal is served family style – to encourage exchange with our visitors from Italian music festivals From Shaman to Shoman and Club Tenco, San Remo’s Singer-Songwriter Festival. If you are a songwriter and would like to sign up to perform at this event, there are about 10 spots available and the list is being handled by Lauralee Brown. Please contact her at lauraleebrown@earthlink.net. I look forward to seeing you there; it’s going to be great international fun.